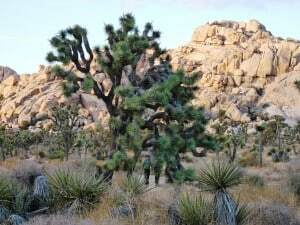 Joshua Tree National Park in southeastern California was set aside in 1936 as a National Monument to preserve a variety of desert animals and plant life including the unique Joshua trees. It became a national park in 1994. Elevations range from 1,000 feet to 5,814 feet with average temperature from 62 – 103 degrees. The annual precipitation averages four inches. The biological diversity within the boundaries of Joshua Tree National Park is fascinating and surreal. The park includes parts of two deserts, each an ecosystem whose characteristics are determined primarily by elevation: the higher Mojave Desert and lower Colorado Desert. Click on the short video to experience the diverse terrain.